This entry was posted on June 4, 2012 by Robyn Lee. It was filed under Pain Shadow Series, Spring 2012 and was tagged with beach, Chuang Tzu, empty mind, healing, health, life guard, Love, meditation, mystic, nature, ocean, peace, philosopy, spirit, storm, surrender, universe, wait, watch, zen. I love this photo. The sky, the water, the sand, the single figure up high. Very awesome. Looks like the cover of an album (cd). Nice. 🙂 Sam Oh, and those clouds. And the quote too…nature is good for stilling the mind. 🙂 Warm wishes, to you as well. There is an art to expression…and I think you’ve become a master! You did capture something special in this image Robyn..it’s called..Emotion. And with it, you also captured our attention! Awesome capture. Who’s the person? Looks surreal – stunning post and photo! He kind of looks like a shadow! Nightlake, thanks so much for that. I do appreciate, and am happy you enjoyed! Thanks so much Cornelia – appreciate that a lot! Wonderful quote and love the photo (although I would hate to be out in that approaching storm). Great photo. 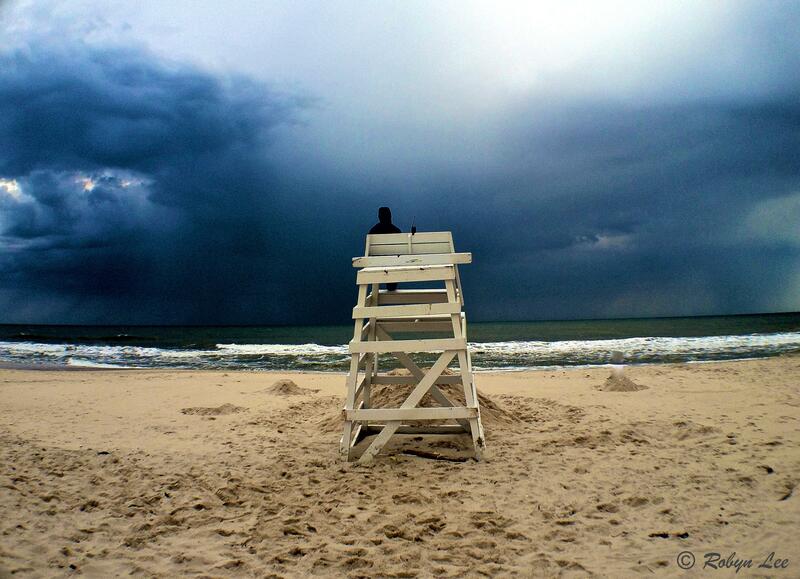 Did not see the lifeguard at first-his presence pales the storm. another great one! Kathy, thanks!! Yes – he appears so small in the image, yet he probably stood at 6 feet tall! Pretty surreal. What a picture Robyn! The wind would bother me but otherwise, to sit and just watch those storm clouds and the churning water…I love stormy weather. That poor lifeguard though!! Aww, thanks Jeannie. I did not realize just how dramatic the image was until later, as I was nearly blinded by the sand blowing in my face 🙂 Yes the wind was not great, but It was kind of cool to be part of it … It was funny how all the other lifeguards packed up and disappeared within 5 minutes of the first raindrops… and this guy stayed on. He just put on his hood and took it in. Kind of nice to see!! Ahhh…stillness the antidote to my post today…:) love the image…you captured that turbulent sky yesterday! Beautiful …. A storm looks imminent! What a captivating photo with the black of the skies, the green of the water and the light sand. It looks almost unreal. The contrasts are so powerful, yet the feeling of this shot is so calm, like there may not even be a whisper of wind. Love it! Thanks so much KT! Yes, it was pretty amazing sky…actually a very very dark blue which was sort of unique. You are so right – major contrast (especial since my drive there 10 minutes prior was bright sun and light blue sky)! This storm came in out of nowhere…and did not last very long, but long enough for me to appreciate the moment of natural wonder and take some photos – and then escape in fear of being gobbled up by a churning ocean 🙂 There was lots of wind btw… but did the image does not reflect it. I liked the mood of this lonesome lifeguard watching. So glad you love it too!! Sending good thoughts your way today KT! Another wow from me. I first saw the words on my email, then opened it to see the accompanying photo.It also tied in with the reading I had just read from A. It is a good day.Enjoy! But what happens when we surrender to the universe? Is that when storms still? Do we call storms to us? And like this man, do we guard only our own lives? Oh gosh Dan…. your comment has swirled my tired head !! Not good for stillness, you know? Ok — Perhaps when we let go and surrender, we achieve the perfect place of stillness? Maybe our surrender comes first – and then the universe returns the favor….? Hmmm… I do think we may be capable of “calling storms” to us — in a subtle energetic way, but I also believe sometimes those storms are just going to happen no matter what, and it’s the way we deal with them that is the determining variable then? (just pondering too ….)! Actually, I do think this man would have guarded more than his own life …. so say I decided to float away into the ocean…and lost myself in those churning waves – I think he would have saved me (or tried) … after all that is why he was still on duty (notice he even has his walkie-talkie by his side). And so, I think we all guard more than our own lives in many ways during our stay here on planet earth. it’s really making me feel something but i’m trying to figure out what that feeling is? i think it is evoking a fear/panic thing, but i don’t know why, i can hardly breathe when i look at it. I don’t find it fear-evoking, for some reason this beaiutiful shot is telling me of the strength of nature but still in a calm, relaxing way. You caught a perfect light and the colors are perfect, Robyn. If there ever was a need to prove you don’t need expensive and bulky gear to take great shots this is it! Stunning!…the photo and the approaching storm. Thanks tons Jill…was kind of surreal as others have said ~ at least I got out for a few! Love it, great moment that you captured. So much stuff going on. Thanks William! So much and also so little at the same time 😉 Glad you enjoyed!!! Thanks again fotografzahl! Yes – this one had a whole different feel than ‘Joyous Surrender” – but was taken only moments after. I have always loved the energy of an approaching storm….beautiful photo…. Thanks so much Celeste… glad you enjoyed and have been enchanted with your blog today as well. Thanks for the link to that poem — beautiful! !